Piled up in my office/living room are bags of plastic eggs, a ton of candy and more boxes of Christian Easter goodies from my favorite novelty supply store. If I polled the audience here, I can almost guarantee that your living room or office looks the same way. No matter how I feel about the whole egg thing, for my area, egg hunts make a good outreach. This year, instead of roping off two areas for egg hunts, (you know one for the kids, one for the bigger kids) I’m doing something a little different. I figured it was time to put those plastic eggs to good use for the Kingdom of God but with a twist! Host a night time egg hunt: Pre-teens too old (or too cool) to hunt eggs love this variation. First, fill the eggs with candy and scripture verses. Attach a glow in the dark sticker to each one or prepare to hand kids flashlights. Arrange the eggs sticker side up and let the shenanigans begin. A night time egg hunt with an outdoor concert afterwards makes the perfect youth activity for this age group. What a fun way to bridge the gap between the pre-teens and teen group. Send kids on a journey: I love the open field Easter Egg hunt format but rather than let kids run screaming through the eggs, why not carry them on a journey. Create stops along the egg hunt and have volunteers usher kids from place to place. Go to the last supper, to the cross and finally to the tomb. Tell the story of Easter along the way showing the settings you’ve created. At this Easter egg hunt, even parents will learn something. Checklist egg hunt: Before kicking off the egg hunt, give kids a checklist. Tell kids they need to find 2 red eggs, 2 blue ones and 1 golden one. Of course, you do have to make sure you have enough eggs for each child. Another way you can make this event more fun is to let kids search in teams or with their parent. 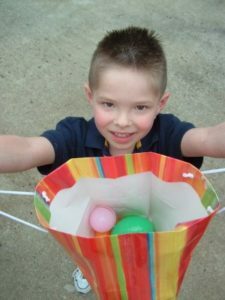 Scavenger egg hunt: For this game, kids will have to collect the clues (hidden inside the eggs) to find a larger prize like a basket of chocolate candies. You could also use this option if you’re facing rain or inclement weather.